The protests at the Banaras Hindu University (BHU) against unabated and increasing incidents of eve-teasing haven't seemed to reach any conclusion. The university continued to remain on tenterhooks as the students' protest turned violent, police lathicharged the protestors, evoking a sharp response from political leaders. Several political parties, including the Congress, have come out to support the students and condemn the Uttar Pradesh government's response and the police crackdown on the students. Vice-Chancellor of the university, Girish Chandra Tripathi, has been summoned by the Ministry of Human Resources Development to Delhi and according to a The Times of India report, he departed for the national capital on Tuesday morning. While protesters claim that he has been summoned by the HRD ministry, the report quoted a university spokesperson as saying that quarterly meeting of the executive council of BHU was rescheduled and Tripathi has gone to attend the same. Amid top issues which were discussed at the Uttar Pradesh Cabinet on Tuesday morning, was the students protesting at the BHU against rampant sexual harassment on the campus. Speaking to the press, government spokesperson Srikant Sharma said that the Yogi Adityanath government has decided to launch a judicial probe into the alleged police excesses in controlling the student protests. Sharma said that strict action will be taken against all those found guilty. Sharma, however, did not elaborate as to whether the probe would be conducted by a retired or sitting judge. Sharma said the government wanted that there should be communication with the students by the local administration, vice-chancellor and other university officials. Sharma accused the opposition parties of trying to vitiate the academic atmosphere. "If they wish to do politics, they should do it with us and not with students. 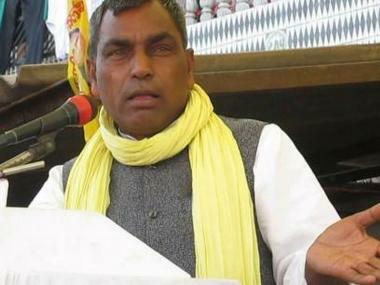 They should keep away from holding agitations in campuses," he said. On lathicharge on the protesting girl students sitting, he said, "We are identifying those 'outsiders' who are using the students to do politics and also identifying those who indulged in lathicharge." He said the government has asked the local administration to strengthen the security on the campus. 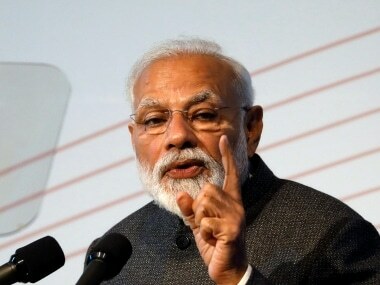 Moreover, Sharma also said that the CCTV cameras will be installed at university campuses, including Lucknow University and BHU, to improve safety arrangements on campus. He also advised university administrations across state to reach out to students and establish a dialogue mechanism, so that students' issues could be addressed before things spiral out of control. Tripathi insists that people from outside the university are responsible for the violence. The latest incident of eve-teasing, which triggered these protests, was reported on Thursday. A woman student of the arts faculty was harassed by three men on a motorcycle inside the campus as she returned to her hostel. 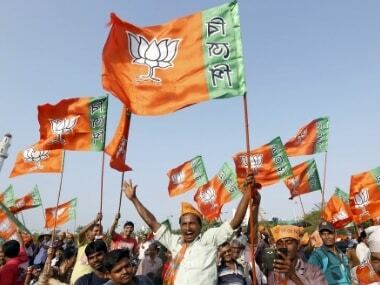 Talking to The Indian Express, Tripathi said that the incident of sexual harassment was "created by outsiders" with "vested interests" who had an eye on the prime minister's visit to Varanasi. He added that while the campus has adequate security measures in place, "security for boys and girls can never be at par". "If we listen to every demand of every girl we won't be able to run the university," the report quoted him as saying. 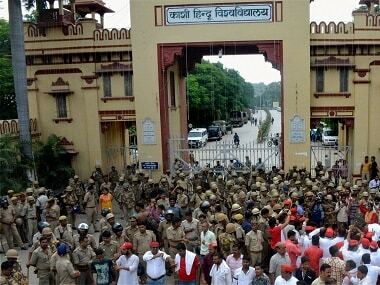 The students of BHU have been protesting outside the vice-chancellor's residence and several female students were injured when the police allegedly used force to remove them. The students reportedly wanted to meet Tripathi but were stopped by security guards. The vice-chancellor claimed that the use of force was against criminals and not girl students, according to The Indian Express report. The girl students of BHU feel that the campus is unsafe because of its poor lighting, lack of CCTVs and uncooperative security guards, according to The Hindu. Following the incident, the woman students submitted a memorandum to the Dean of Student Welfare. It states, "Boys come from outside and engage in objectionable acts... They pelt stones, and use filthy language while passing by." Tripathi further said that the protests escalated due to rumour mongering. While talking to reporters on Tuesday, he said that while the identity of a person is important, we should also take care of the identity of institutions. Earlier he had said that the sexual harassment was a "simple case of eve-teasing." According to an NDTV report, Tripathi alleged that the incident was deliberately staged a day before Modi's visit. State governor Ram Naik constituted a committee headed by the Chief Secretary to examine how the "police behaved and other aspects". Varanasi divisional commissioner, Nitin Gokarn sent an interim report to the Uttar Pradesh chief secretary on Tuesday. In the report, Gokarn blamed the university administration for the violence. "The BHU did not deal with the victim's complaint properly. It is a sensitive matter. The situation was not handled on time by the university administration,"he said in the report, according to India Today. The Uttar Pradesh government removed three additional city magistrates and two policemen in connection with the baton-charge on students. Station officer of Lanka police station Rajiv Singh was removed and sent to police lines. Chief Minister Yogi Adityanath ordered an inquiry into the violence and sought a report from the Divisional Commissioner about the incident as well as on the lathicharge on journalists. Some journalists and girl students were injured in the police crackdown on Saturday and it led to protests in Lucknow, with some journalists staging a sit-in near the chief minister's residence. 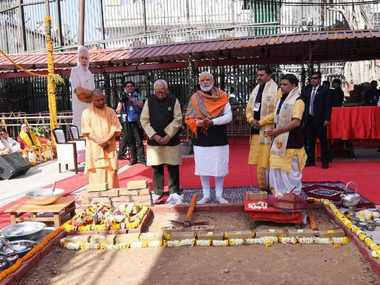 Prime Minister Narendra Modi and BJP chief Amit Shah have spoken to Adityanath over the police action, Union minister Nitin Gadkari said, adding that the state government will find an appropriate solution to the issue. He said the party was committed to ensuring dignity and respect of women and any opinion should not be formed on the basis of any isolated incident. Various political parties, including the Samajwadi Party, criticised the government and condemned the police action. AAP condemned the midnight police baton charge on girl students. Party leader Saurabh Bharadwaj said that it is unpardonable and shameful that police, instead of acting on the girl student's complaint of alleged molestation, ordered male police personnel to enter girls hostels during night hours. Uttar Pradesh Congress Committee president Raj Babbar was arrested along with other party leaders ahead of their participation in a protest demanding Tripathi's sacking. The Times of India report quoted Babbar as saying, "It is shocking that I am not being allowed to reach BHU to meet the injured girls and know their problem. They (policemen) started a bid to stop me from the airport." The National Students Union of India (NSUI) and the Akhil Bharatiya Vidyarthi Parishad (ABVP) staged demonstrations in New Delhi on Monday against the baton-charge on BHU students. ABVP demanded constitution of a fact-finding committee, while the NSUI demanded an inquiry under a sitting high court judge and resignation of the BHU vice-chancellor. The two student organisations had separately announced their plans to stage demonstrations outside the office of the Ministry of Human Resource Development (MHRD) in New Delhi. However, the NSUI claimed that it supporters were detained much ahead of the venue, while ABVP activists were allowed to reach the site.